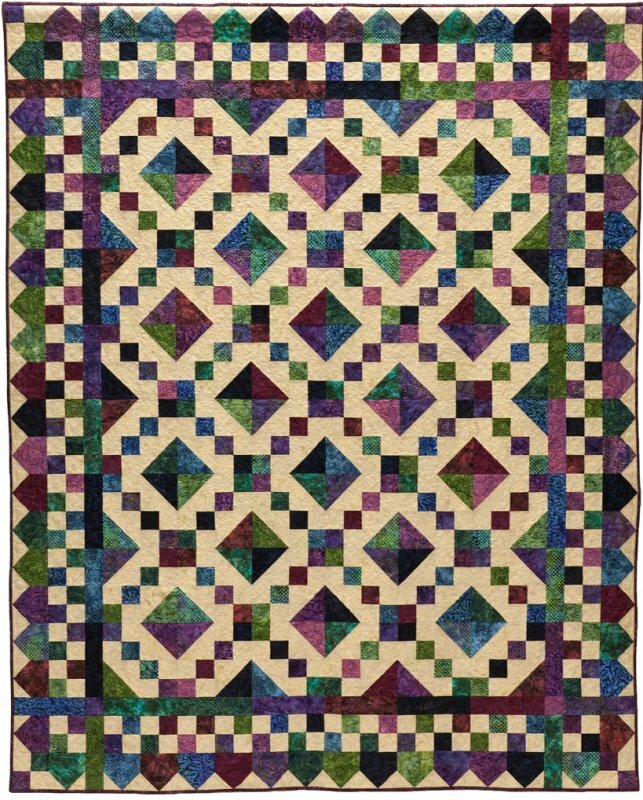 68" x 84" or 84" x 100"
This traditional Jewel Box quilt really sparkles with the addition of a fun pieced border. The pattern includes 2 size options – 68" x 84" or 84" x 100". The smaller quilt uses an assortment of 16 "Dark" prints (3/8 yard each) and 3-5/8 yards of 1 Background print. The larger quilt uses 20 "Dark" prints (1/2 yard each) and 5-1/4 yards of 1 Background print. Instructions are also included for cutting the Dark prints from your stash. We recommend 4" half-square triangle paper for accurate triangles but we've included instructions for piecing your triangles without triangle paper if you prefer.